§ 67.405 Medical examinations: Who may give. specifically designated (Senior AME) for the purpose may give the examination for the firstclass medical certificate. Any interested person may obtain a list of these aviation medical examiners, in any area, from the FAA Regional Flight Surgeon of the region in which the area is located. (b) Second and third class. Any aviation medical examiner may give the examination for the second or third class medical certificate. 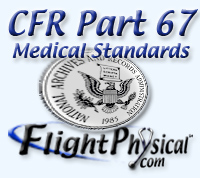 Any interested person may obtain a list of aviation medical examiners, in any area, from the FAA Regional Flight Surgeon of the region in which the area is located.